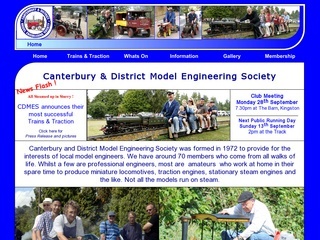 Canterbury and District Model Engineering Society was formed in 1972 to provide for the interests of local model engineers. We have around 70 members who come from all walks of life. Whilst a few are professional engineers, most are amateurs who work at home in their spare time to produce miniature locomotives, traction engines, stationary steam engines and the like. © 2016 Wavetech Consultancy Ltd.